As part of our Young Leaners Project, we visited the city of Victoria on Vancouver Island for one day. We got up very early and met at Canada Place, where Discovery Canada Tours picked us up and took us there by bus and ferry. During the drive our tour guide Kim gave us a lot of information about the surroundings and Victoria. She was so helpful and had an answer to anything you asked, as she grew up in Victoria and knows the city like the back of her hand. Taking the ferry was already exciting for us as you have great view on the sea and countryside of Vancouver Island. We got some coffee and snacks, had a look at the gift shop and the different decks. Arriving on Vancouver Island, Kim gave us suggestions what to do and see in Victoria after our bus tour that took us one time through the city and gave us an overview over the places and sightseeing’s. It was nice because it made it easier for us to orientate and decide what we want to see. We separated into groups of at least three people everybody started to explore. We got dropped off at Royal British Columbia Museum and strolled up Douglas Street which is the main shopping street in Victoria with a lot of Souvenir shops and cafes. After that we went to China Town and then stopped at the restaurant “The Local” which was great! We walked back along Government Street which was nice as you see buildings like “the Empress” and the port of Victoria. We ended our stay by visiting the legislative Building and it was amazing! They put up lights all over the building and it was simply impressive. We took many pictures and then went back on the bus where everybody was falling asleep as we went back to Vancouver. 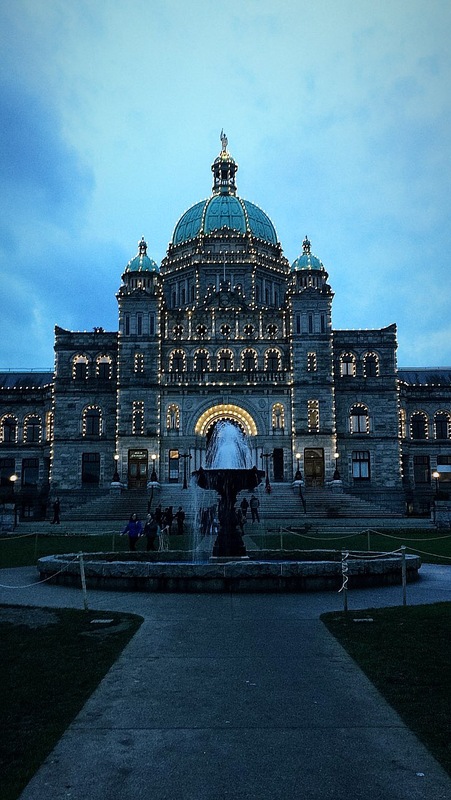 It was a great day and I can only recommend to visit Victoria, as it is also the capital of BC. Are you planning to study English in Canada? Find out more about EC English Courses in Vancouver!